Marly Mathews: Cover Art for The Witch and the Wolf!!!! Cover Art for The Witch and the Wolf!!!! In my personal opinion, the cover art for The Witch and the Wolf is delightfully delicious! I'd love to hear what you all think of it! The amazing cover artist is Alex DeShanks! The Witch and the Wolf is a paranormal historical coming soon from New Concepts Publishing. 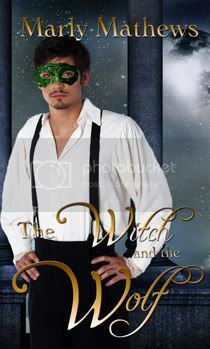 The hero is a spy for England during the Napoleonic Wars--and the heroine is a witch with some espionage in her life as well! I love it Marly, Congratulations!!! You've been tagged. Hee hee! TAG! You're IT! See my blog for details!!! Thank you, Carol Ann and Jenna for tagging. And I say that with a huge dose of sarcasm. RWA Online Chat-Inspirational and YA Genres! Which City to do you belong in?